One of the most familiar images of the NYSE on the evening news is the loud ringing of a bell, signaling the opening or closing of the day’s trading. Trading floor bells are more than just a colorful tradition. They are critical to the orderly functioning of the marketplace, assuring that no trades take place before the opening or after the close. Bells were first used at the Exchange in the 1870s with the advent of continuous trading. A Chinese gong was the original bell of choice. 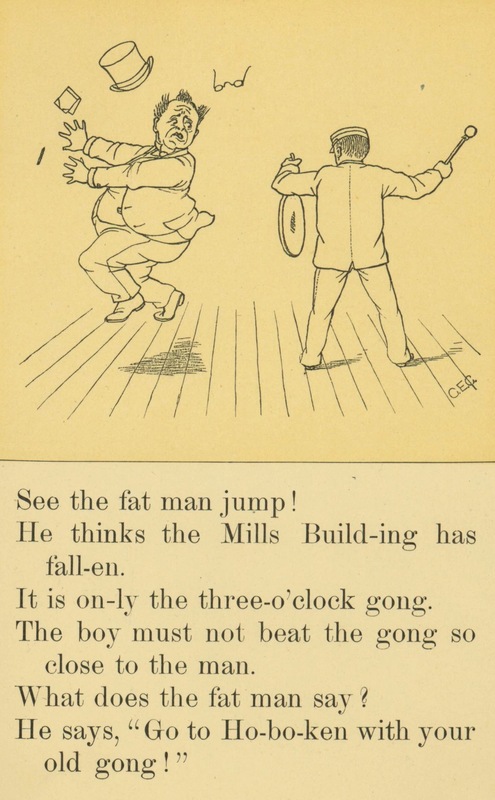 But in 1903, when the Exchange moved to its current building, the gong was replaced by a brass bell — electrically operated and large enough in size to resonate throughout the voluminous main trading floor. Today, each of the four trading areas of the NYSE has its own bell, operated synchronously from a single control panel. The brass bells functioned without incident until the late 1980s, when the NYSE decided the time had come to refurbish them and purchase a new one for backup. With that decision, the Exchange learned just how unusual its bells really are. First, the Exchange had to identify the manufacturer of the bells — a firm with which the NYSE hadn't done business in more than 80 years. With some digging, the G. S. Edwards Company of Norwalk, Connecticut, was rediscovered. However, when the NYSE officials explained that they wanted to purchase a new bell, measuring 18 inches in diameter and matching the old, representatives of the Edwards Company were astonished. It seems that neither Edwards nor any other company, makes bells anywhere near that large — or loud — today. Edwards agreed to make a new bell from scratch, bringing former employees out of retirement to handle the job. Sound measurements were taken, and the tone of the bell was matched to the NYSE’s existing bells. Along the way, too, came the discovery of a massive old bell hidden within the infrastructure of the NYSE. An electrical contractor, on hearing of the plans to upgrade the bell system, recalled how he had once seen a bell in the crawl space above the ceiling of the main trading room. The long-forgotten beauty — a whopping 27 inches in diameter and covered with a thick coat of dust — was removed and reconditioned. It turned out to be another 1903 original and is believed to have been buried in its resting place for half a century because it was simply too loud even for the Exchange. Toned down, it now gleams on a platform above the trading floor, patiently awaiting its recall to duty if the need ever arises. When the NYSE moved into its new building at 10-12 Broad Street in 1865, “calls” of stock were made twice a day in the second floor Board Room. The president kept order during trading sessions with the aid of a gavel. The gavel has always been used in conjunction with the closing bell, perhaps in recognition of the 19th century stock calls. The gavel strikes a "sounding block," a turned block of wood, possibly oak, from the center part of a log (you can see tree rings on the bottom side). This sounding block, or one of a similar size and shape, appears in the 1928 motion picture film, "The Nation's Marketplace." 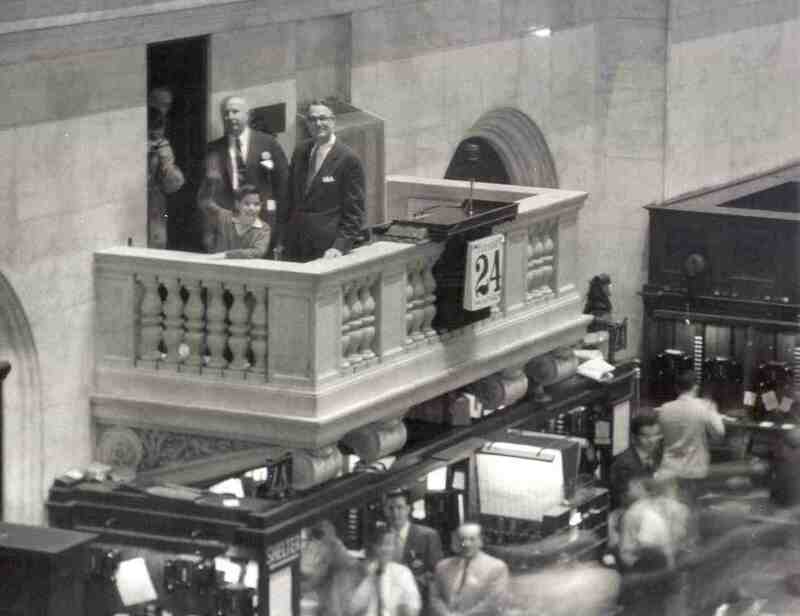 The first guest to ring the opening bell was Leonard Ross, in 1956 (pictured at top of page). The 10-year-old had won a television quiz show answering questions about the stock market. An expert analyzed the sound of the bell for the NYSE’s trademark registration as follows: "The mark consists of the sound of a brass bell tuned to the pitch D, but with an overtone of D-sharp, struck nine times at a brisk tempo, with the final tone allowed to ring until the sound decays naturally. The rhythmic pattern is eight 16th notes and a quarter note; the total duration, from the striking of the first tone to the end of the decay on the final one, is just over 3 seconds." View information on today's Bells and upcoming Bells. View bells from the past few market sessions.